Not that I need an excuse to bake, but yesterday was World Baking Day and I decided that it was about time I got more adventurous with my cakes. With my staples already purchased, I went to Hilary’s on Mill Road to get some fruit – a lemon, some large oranges, blueberries, strawberries and cherries (my bargain tip is the strawberries – just £1.25 a punnet!). I wasn’t sure yet quite what I was going to create, but all the fruit looked colourful and I was determined to use all of it in some way or another. After looking at various sponge cake recipes I decided to base mine on this one, as it was for moist sponge cake – my last cake turned out a little drier than I had hoped. Instead of the vanilla extract I used fresh lemon juice. I preheated the oven to gas mark 4 and although the recipe says it’s for making three layers, I decided to hold off on greasing and lining my cake tins until I had made the mixture. I mixed the butter and sugar together thoroughly before beating in my eggs (one at a time). I then mixed the milk with some juice from the lemon (about a tablespoon), and added this liquid to my mixture – alternating between adding a little liquid then a little flour. Although I have an electric whisk, I didn’t use it and instead just beat thoroughly with a wooden spoon – there were a few tiny lumps of flour in the mixture, but I vaguely remembered that Mary Berry had said (during the Great British Bake Off) something about this being fine and in fact making the recipe better. I had three cake tins but none were the same size and even though I borrowed a couple from neighbours I still couldn’t find two to match, so I used two similar ones – there was quite a bit of mixture, but not enough to comfortably fill three cake tins. I lined and greased the tins adding half of the mixture to each before putting in the oven. The recipe had said that they would take about 20 minutes to bake, though it was about 40 minutes before they looked ready (I guess it may have baked quicker if I’d used three tins). I did the skewer test (inserting a skewer into the cake, it comes out clean if the cake is ready) and although a little sticky I decided that it was fine as the cake was a lovely golden brown and in any case I wanted a moist cake. I removed the sides of the cake tins, though not the bases and then set aside to cool for about twenty minutes. This gave me time to make some orange marmalade. I grated the zest of the orange into a separate bowl first (as I would need this later for the buttercream icing) and then cut the orange in half and scooped out the fruit from inside (turning each orange half inside out seemed a good way to do this). I then cut the fruit finely and discarded any large white bits. I heated my finely cut fruit in a small saucepan, adding a couple of tablespoons of water and after about ten minutes of simmering I added about 200g of sugar – I didn’t measure the fruit or sugar, but the general rule for jams seems to be using equal amounts of suagr and fruit. I simmered this on a high heat for another ten minutes – stirring regularly – and then put a teaspoonful on a plate in the fridge. After a couple of minutes it wrinkled when prodded, so I knew the marmalade was ready. I carefully removed the cakes from their bases using a fish slice and spread a layer of marmalade over each. I mixed up some buttercream icing by combining 250g of butter with 550g of icing sugar before adding the orange zest I’d set aside earlier. I smeared some over the marmaladed bottom layer of my cake before placing the other layer of cake on top. I then spent a good twenty minutes smearing the rest of the buttercream icing all over the cake, making sure the sides and top were covered. This looked delicious, but not particularly healthy! So I added the remaining fruit – strawberries, blueberries and cherries – as decoration. I had never made anything as visually pleasing before and have to admit I was rather proud of my creation. I had planned to take some round to my neighbours, however all but three slices didn’t even make it out of my kitchen as word began to spread that a cake was being made. A friend said I should call it a ‘Five a day’ cake as it contains five different fruits – though you’d probably need to eat more than a whole cake to actually get your official five a day, so I’d advise against relying on it for dietary RDA’s (!). It tasted delicious and the sponge was lovely and lemony as well as perfectly moist. I will probably use the same sponge cake recipe next time, perhaps with about 40-50g more flour, though I’m definitely a few steps closer to creating my own signature sponge base – and once I’ve got that perfected, I can really have fun with the decoration! A lot of fruits are coming into season now and you can of course purchase plums and punnets of raspberries, blackberries and the like from any one of a number of shops on Mill Road (my current favourite is Hilary’s greengrocers in Romsey), but there’s also plenty of fresh fruit growing locally – I’ve eaten blackberries, strawberries and plums all straight from the plant/tree around Mill Road recently. 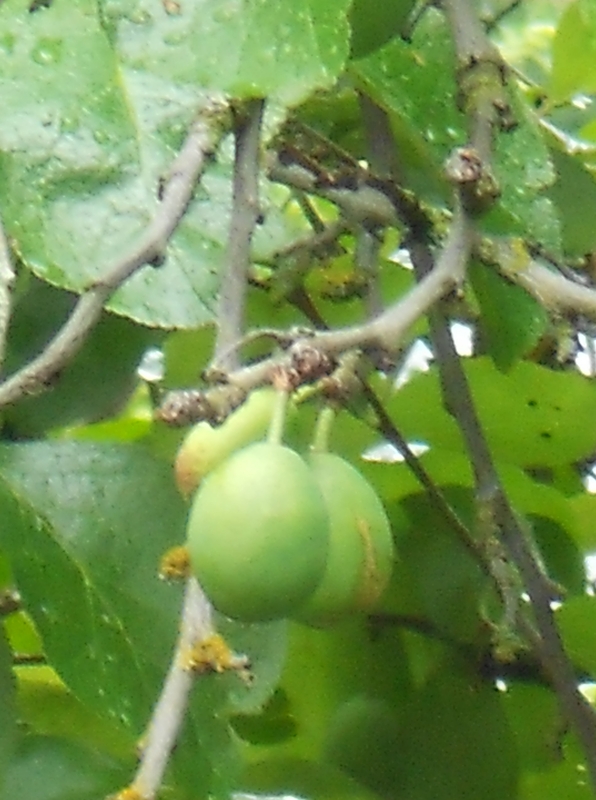 I’ve been watching the plum tree in my back garden in recent weeks. Some of the fruits have looked ready, especially the higher ones that get more sun. However, this has presented problems – I didn’t want to shake the tree and end up dislodging plums that weren’t ready yet. So in a moment of ingenuity (or madness…?) I decided to make my very own plum catcher! It is in fact just a long bamboo stick with a piece of material attached to one end. I’ve been prodding the stick at the tree and catching the falling plums in the material bag. I had my doubts about how successful this might be at first, but I have to say it’s been great and I’ve managed to get about thirty or so plums by leaning out of my first floor window with the plum-catching contraption. Admittedly, this has raised a few eyebrows from the neighbours, but once I’ve explained my reasoning they’ve seemed to understand. I like plums, but it would take a while to get through the fifty or so ripe fruits I’ve gathered in the last week, so a few days ago I decided to try my hand at making some plum jam. My online search seemed to suggest that this was not going to be easy, especially as I’ve never attempted jam before. But I found the process very easy and quick indeed. Armed with a couple of small jam jars I bought at Cutlacks, I popped into the Co-op to buy some sugar. The recipe had suggested that ordinary granulated sugar was what was needed, but when I spotted ‘Jam Sugar’ on the shelf I decided to opt for that instead – not only did it sound like the right thing, but it committed me to actually making the jam, rather than just talking about it (!). I sterilised the jam jars (necessary if you want the jam to last in the cupboard for a few months) by washing in soapy water and then putting in the oven on a low heat for a few minutes. I then set about chopping my plums, removing the stones and cutting each one into about four pieces. 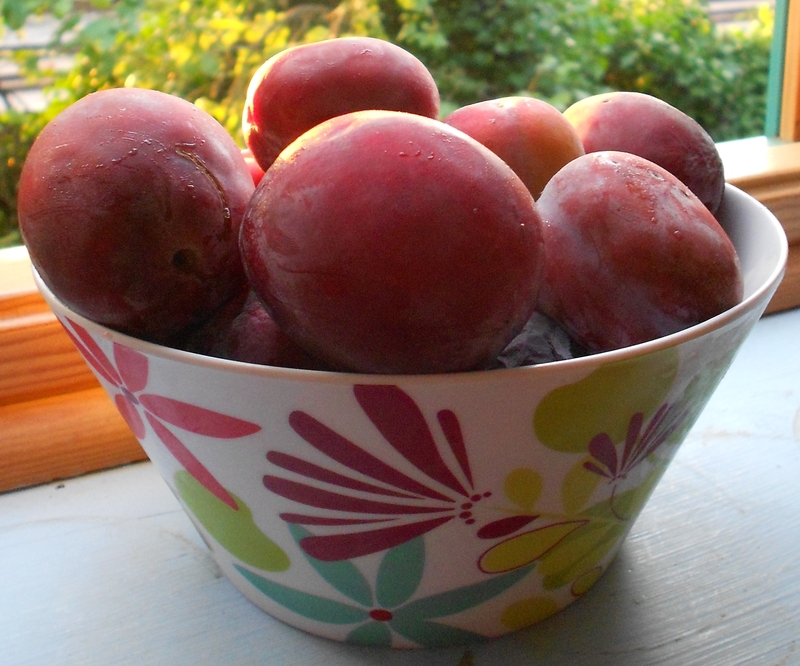 I then weighed the plums (about 300g) and started simmering them in a saucepan. As they turned into a nice looking ‘sauce’ I stirred in the sugar (300g – same in weight as the plums) and cooked on a high heat for about five minutes. I then did the ‘setting test’, which is just a matter of putting a small amount on a cold saucer in the fridge for five minutes, and then checking that it wrinkles when prodded. It wrinkled and so was ready to put into my jam jars! The only thing I would do differently next time is try using ordinary granulated sugar – I now have about 700g of jam sugar left over, which just doesn’t look like the sort of thing I want to use to sweeten my coffee. 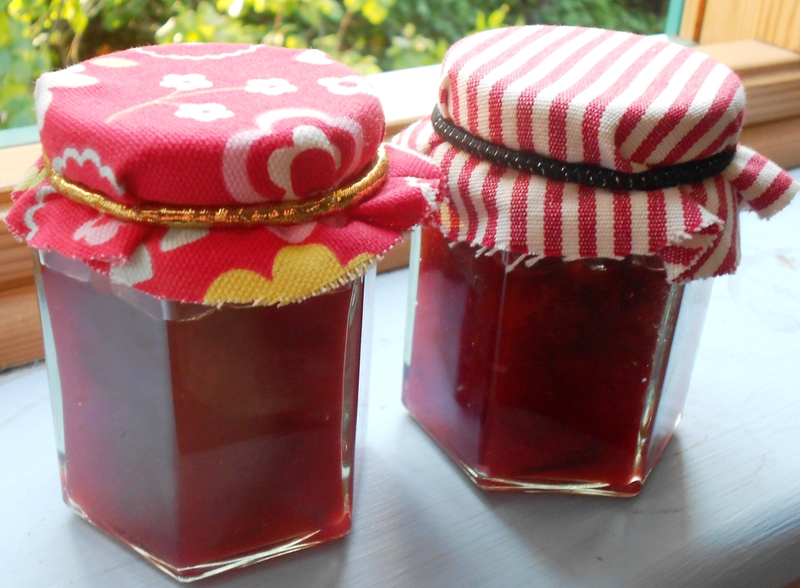 If you’ve always quite liked the idea of making jam but have been put off by its seeming complexity, please try it – the whole process took me less than half an hour and tastes lovely!